Cherry Hill, NJ – Nobody parties like the Ikarians. 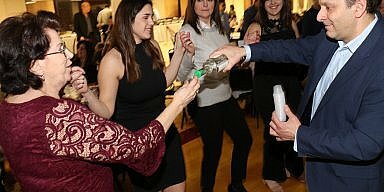 Each year, in the cold and sometimes snowy winter weather, the Delaware Valley Ikarian community throws a soiree that celebrates their island home. Music is the driving force that brings these folks together. 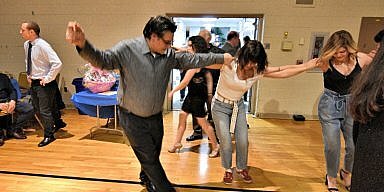 This year’s dance was hosted again at the Danielle Kousoulis Greek Center of St. Thomas Greek Orthodox Church in Cherry Hill, NJ. Seizmos Music joined forces with Valantis Theodoropoulos, and Yiannis Frangos and put on a performance that saw a whole lot of Kefi go in the morning hours. People of all ages joined hands on the dance floor. They circled and jumped to the traditional sounds of their Island home. 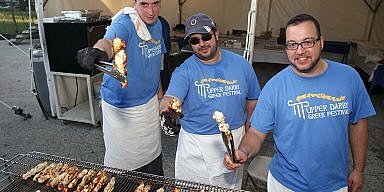 The annual event also featured excellent food. Effie’s Catering fed the troops and kept them happy through the evening’s affair.